Juveniles : Males grow faster and the lips look bigger and thicker. This can be noticed around 3-3.5cm (1.2-1.4") mark. Sub-Adults : Females are much more aggressive. When a shell has been chosen, she would never leave that site while the males will often wonder around the tank. Females will also turn half orange/yellow (front half of the body) when fighting amongst females and when they are sexually active. Males can do this but rarely. The colouration isn't as intense as the female and would only be for a few seconds. Generally an adults will attain the following size. 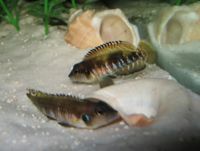 These shelldwelling Cichlids display conspecific aggression which is extremely high amongst females. Contrary to popular belief, they are relatively peaceful towards other tank mates, however they will defend their territories aggressively. Not a fussy eater. Live and frozen varieties should form the bulk of the diet, although dried foods are usually accepted. Tanganyikan set up is needed with sandy substrate preferred as they will dig. Sharp substrates should be avoided. Shelldwellers, behaves like similar fish such as Lamprologus ocellatus. These fish can be kept as a pair, or in harem as the alpha male will bond with multiple females.